Shape and size are the key. Have a room that seems too short? Pick a tall mirror and angle it up a little bit. Need a little more horizontal space visually? Pick a large, wide mirror. In addition to that, uniquely shaped mirrors – waves, ovals, lozenges, and the like – can add their own unique touches to a room, making sure that your room is eye-catching and draws plenty of attention. Choose what works best for you and the style of the room that you’re trying to choose your mirror for, taking into account size and space considerations. Placement can be important. If you don’t want conversations to be diverted by guests constantly watching themselves, place the mirror a bit away from conversation centers, reflecting the room more than the people in it. If you want to make the room seem taller and add a sharp modern touch, angle the mirror slightly up. Choose what fits your space and the style of your room best, and remember to always carefully measure to make certain that you’re getting the best possible fit for the space available to you – if your mirror is dominating the room too dramatically, resulting in clutter and overly crowded spaces, it damages the entire point. For those of you seeking an artistic touch, clusters of small mirrors can add a fun, fresh touch to a room, breaking up a space visually while adding extra space to a room. Try combining different shapes and sizes for the most eye-catching effect. You can buy a variety of mirrors yourself, or buy one of the many pre-assembled sets of small mirrors already out there. Do you want bubbles, squares, a mix of the two, or something else entirely? Figure out the style that works best for you. A good mirror enhances the best aspects of the room it’s placed in, reflecting your unique sense of style and contributing an illusion of space. Let your mirror – and your room – reflect the best pats of you, putting them on display. 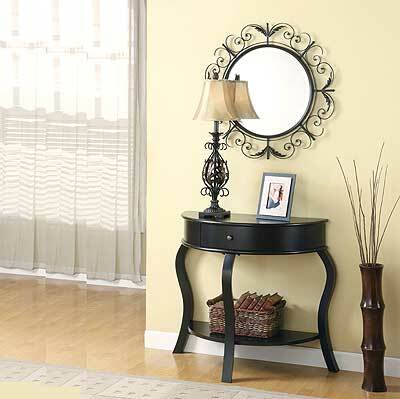 In the end, the perfect mirror is the perfect compliment to any modern living room, hallway, or even dining room. In some ways, there’s nothing more luxurious than a warm day spent outside in the sunlight, especially by the side of a pool. Furthermore, time spent in the sun (with proper sunscreen) helps your body, encouraging production of vitamin D and helping to improve your mood. While anything can do for this – a blanket or a towel – sitting on the ground can rapidly get uncomfortable and hurt your back. Given the health and emotional benefits of time spent outdoors, why not invest in good patio seating to make the experience perfectly relaxing? The right piece can make relaxing outdoors feel elegant and restful, and you might soon find yourself spending more time outdoors than indoors. There are several options for patio seating and relaxation, of course. From lounge chairs to outright beds, there’s sure to be something sturdy and weather-resistant to meet your outdoor needs. Lounge chairs and chaise lounges are the archetypical choice for outdoor relaxation. Designed to let you relax totally while still supporting you enough to let you read and eat with comfort, it’s possible to spend hours in one of these chairs. Modern lounge chairs are often sleek and stylish, as much works of art as chairs – but they’re still entirely functional, and incredibly comfortable! UV-resistant and weather-resistant sitting chairs can provide spots to talk with friends, eat meals outdoors, and otherwise work and have fun outside. From armchairs to sofas to dining chairs, there are a range of outdoor pieces designed to endure the sun and rain and keep sturdy and functional for years. 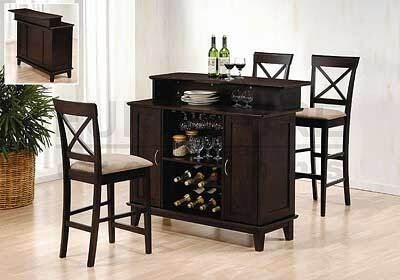 They can be paired with coffee tables, dining tables, and more, and many chair sets come with matching tables. 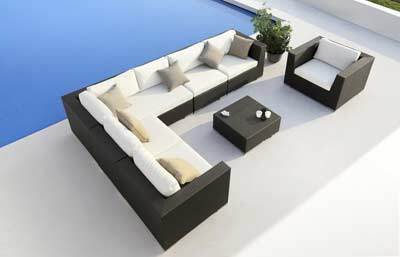 Patio beds provide the ultimate in decadent relaxation. Designed to resist the weather and provide somewhere cozy and secure that still lets in the sun, they’re perfect for catching a quick nap outdoors. Many modern patio beds come with retractable canopies if the sun is getting in your eyes too much or if you worry about sunburn. Cats know that sleeping in the sun is the best – find out why. Or, if you don’t feel like napping, use them to get a beautiful, comfortable view of the sky, at night or during the day. Whether you’re looking to enjoy the sun, to get some refreshing air, or to stargaze and cuddle on a romantic evening, good patio seating will provide the perfect compliment to your outdoor activities. 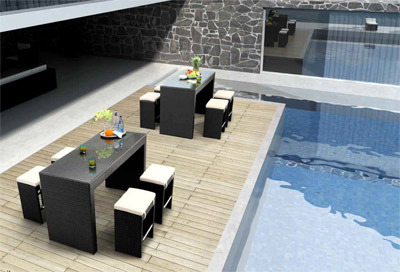 Find a patio furniture set to suit your life and needs today, and begin to enjoy the outdoors with style, relaxation, and ultimate comfort. Your couch will always be the center of your living room, of course, but things don’t have to stop there. In addition to providing comfort for guests or children, accent furniture such as armchairs and corner seating can serve to bring a room together. If you’re looking for the perfect finishing touch for your modern living room that’s both stylish and functional, a contemporary armchair might be your perfect choice. What seating styles are there? Armchairs are, perhaps, the most traditional compliment. A comfortable armchair can be the perfect place to relax and read, or a great place for guests to get a chance to rest in. Many armchairs come with features like swiveling bases to allow for even more convenience and relaxation. Whether you’re watching television with your family, having a deep conversation, or just reading, there are few better choices. Loveseats are similar to armchairs, just designed for two. If you’re trying to draw a special someone closer, they can be a fine choice, and of course if you have a couple as guests they’re absolutely perfect. With enough space to stretch out and relax, without taking up as much room as a sofa, a loveseat can provide the perfect accent seating solution. Ottomans, in addition to being a great footrest, provide a quick, mobile seating option for when things are just too overcrowded. Bring one out and add seating room without sacrificing space. Sectional seating can take the place of a sofa or compliment one. Many sectional seating options are meant to fit into a corner, providing a space away from the main room to relax and talk. If you have a corner you don’t know what to do with, why not provide people with a place to relax? The feeling of relaxing in a chaise lounge is decidedly glamorous, and if you need somewhere to take a quick midday nap, one can be ideal. It’s also well-suited for reading in a more casual, relaxed way. Why not just a sofa? For those who only have a few guests over at a time or who have smaller families, it might be difficult to figure out why to not just stick with a sofa. The most obvious reason, of course, is the fact that a sofa provides room for four or so at the absolute most – and even then, conversation and relaxation are stifled by the fact you’re forced into a straight line, making conversation difficult. Even for a smaller group, the convenience of accent seating can be invaluable. The modularity of accent seating allows you to arrange things to maximize the chances for communication. In addition, accent seating can pair with a sofa to bring a room together. Add a splash of color with a brightly-colored modern loveseat, or harmonize with a warm-toned room with a fine dark leather armchair. No matter what your room needs, accent seating can form an anchor along with your sofa and coffee table. In short, accent seating provides form and function all in one, without taking too much space or cluttering up a room. For those of you who need both practicality and style, the perfect armchair can be the ideal solution. In the modern world, it can be difficult to balance out comfort, space, and style, especially in the bedroom. Apartment living makes this especially difficult – with space at a premium, bedroom furniture can seem far too large for any room. But sleek, modern bedroom furniture often offers many options to make things more compact without sacrificing a bit of style or comfort in the process. 1. Beds with storage shelves underneath can save space that would be taken up by dressers or nightstands. Store bedding, clothing, nighttime reading material, or anything else you want, without taking up any more space. In addition, built-in drawers prevent the visual clutter of having things underneath a normal bed. 2. Unusually shaped beds, such as round beds, provide the same amount of comfort and a unique touch while also fitting into interestingly shaped spaces. Need a bed that will fit in a tight corner? A round bed might be the best choice, and it’s sure to draw pleasant attention. In addition, some round beds come with shelving and storage built to fit around the unique curves of the bed, providing still more room. 3. Smaller, sleeker beds may not be good for two, but for one they can visually broaden the space and provide a comfortable night’s sleep. Many smaller modern beds are built with the comfort of one person in mind, and they share the sparse, stylish design of their larger cousins. 4. Some modern beds have still more extra features built in to save space, such as built-in lighting, built-in audio systems, and other features to make your life as convenient and clutter-free as possible. Modern and contemporary furniture can visibly open up any small space, and nowhere is that more true than in the bedroom. Most modern and contemporary beds blend style and function, offering extra storage, extra space, and extra room while also giving the room a clean, elegant feeling. If you’re tight on space but don’t want to sacrifice any style or comfort, a modern look might be the best way to go. Kids like to be left on their own. They like to lie on the floor with their entire spread of toys in front of them. They like to jump around and roll on the floor but in the event, they do not like getting hurt, do they? Absolutely no! A kid getting hurt while playing on the hard floor is an awful, horrible thing. They are delicate little creatures. Their soft skin needs to be protected. This is where the need of a nice, soft and warm rug comes into play. A rug on the floor is very useful to keep your kid from getting hurt due to an accidental fall. Kids are also extremely conducive to catching a cold while playing on the floor. The warmth of a rug will prevent them from the cold too. Kids Rug: how should it be? First and foremost requirement is softness. Kids have delicate skin. A coarse material is likely to cause rashes on your kid’s skin. Prevent this by buying a soft material for the rug. It should be delicate and soothing. Do not buy a small rug. The rug should be large enough to cover the entire room. Choose a color that your kid will like. Avoid dull and boring colors. Get a rug that has a bright, happy color. Blue, light green, pink, yellow are good picks. Rugs these days come in so many different patterns and designs. 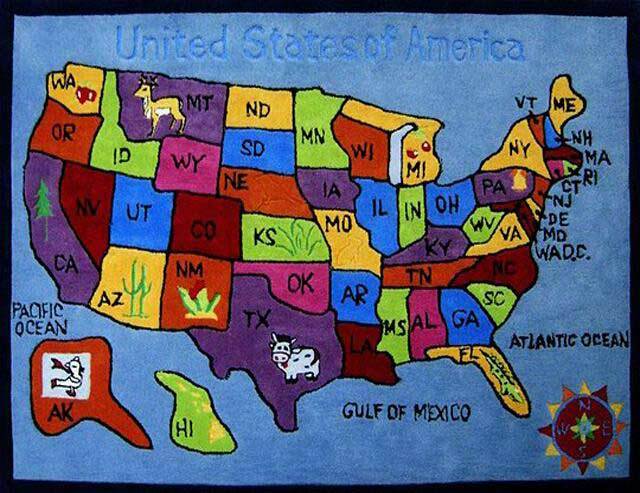 There are rugs with geographical maps, cartoon characters, ships, color blocks, alphabets and so much more. Find out your child’s interest and choose a rug accordingly. 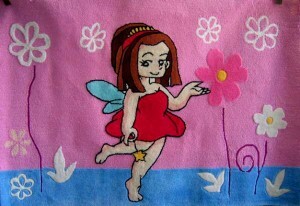 For example, if your baby girl is fond of Barbie choose a rug which has images of Barbie on it. Rugs can serve multiple purposes. Some examples are for playing, watching TV, studying and for educating the kid. Yes, rugs are a very good means to educate your kid about different things. The script rug has numerous words written on it. Words in white with a black base rug looks classy. Sit with your child and hunt new words on this rug of word maze. 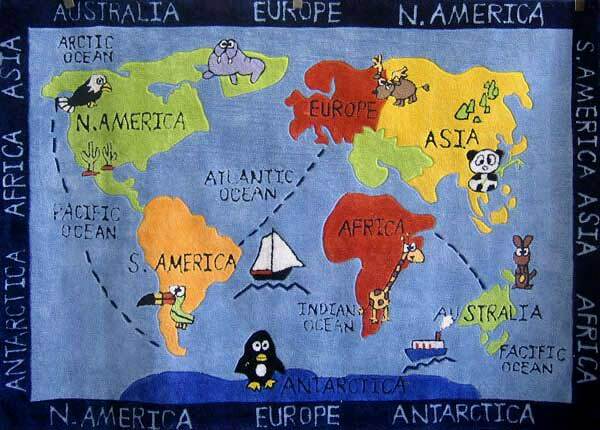 Geography can be made fun with the rug that has a map of continents on it. Watch your child jump onto the rug with enthusiasm as he glides from one continent to the other. ♦ The rug is sure to get dirty, what with the kids spilling food and water all over it. In such a scenario, it would be wise to get a rug that can be easily cleaned. ♦ Make sure that the rug is free from harmful chemical that might be infectious for your child’s skin. ♦ The hand tufted planes rug has different types of air planes flying all over it. Get this rug and watch your kid zip-zap-zoom into the world of airplanes! ♦ The happy life beige rug is sweet, colorful and fun-filled. Watch your child make friends with elephants and giraffes as he beams with happiness while playing on this rug. Why Your Kids Need Special Lamps? Playing, reading, doing homework, drawing, painting and even jumping! So many actions connect a kid to his room, sleeping is definitely not the only one. Like the rest of the house, your kid’s room also needs proper lighting. The lighting is needed not merely to light up the place, but to aid your kid’s sight extra carefully. It is more important to buy the right lights first, more than positioning the lights in the right place. Kids need special lights. There are more reasons than one to convince you in this regard. First and foremost is safety. Electricity is very dangerous; it may turn lethal in some cases. It is best to keep the kids away from electricity but sometimes you can’t do without it. In such cases it is wise to choose lamps which are specially designed keeping kids’ safety in mind. Next comes eyesight. Most kids these days are inflicted with poor eyesight. A major reason behind this is poor lighting. Parents fail to pay heed to lighting while designing their kid’s room. There must be separate lights for the study area and the play area. Both require varying intensities of light hence, the need for specially designed lights. 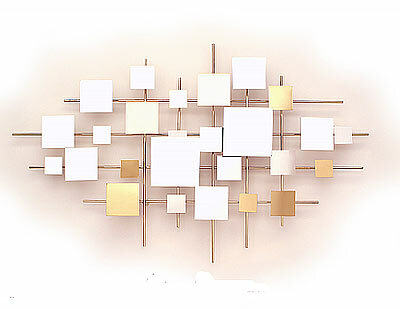 Ceiling lights, wall lamps, hanging lamps…, the needs are as numerous as the choices. Lights also need to be shock proof so that even if your child accidentally touches a light switch with wet hands, s/he does not get an electric shock. Kids and mistakes are inseparable. As long as they are kids, they will make mistakes. It is the duty of parents to protect them from any kind of mishap. Kids love to throw things around. They love to break things and in their (mis)adventures, the lights become soft targets! It is therefore necessary to choose lights that are not fragile and have an outer cover made of strong unbreakable material. The rule of the thumb says: place the lights in a place out of reach of the children. Ceiling lights are a must as they lit up the entire room. Wall lights are needed when you want to focus on the light onto something. 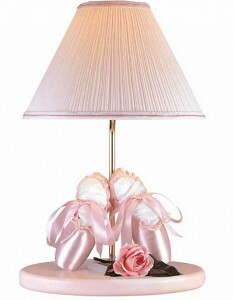 Table lamps are indispensable. Be it reading, drawing, studying or doing homework table lamps are always very important for the kid. These days specially designed and theme based lights for kids are available. Lights in the shape of different animals and cartoon characters are wonderful additions. They come in bright colors and are extremely innovative and beautiful. Lights to match every theme are available. Lights in every shape and form you can imagine are available like from sun to the moon, flowers, boats, footballs and fairies. • Clock lamps: this is a cute combination of lamp and clock. 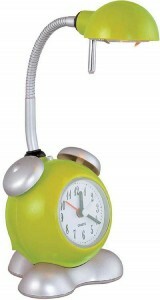 Available in teal, pink and green this table lamp sees to it that your kid remains bright and punctual! 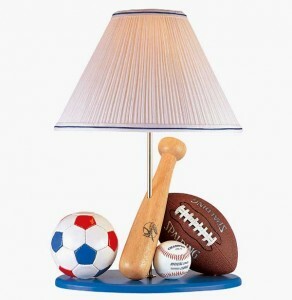 • The Sport desk lamp comes with soccer, football baseball balls with a baseball bat. 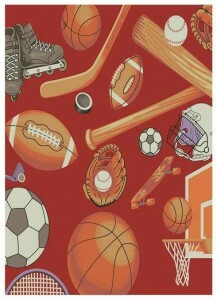 This is a great way to get your child interested into sports. Get the lights and brighten up your child’s life!